Cathy's Cuppa: IF I were to have an automatic coffee maker, THIS would be it. IF I were to have an automatic coffee maker, THIS would be it. This baby is made from glass, steel, aluminum (in the outer frame only), hardwood, with the tiniest bit of silicon, and one tiny piece of medical-grade food-safe plastic. 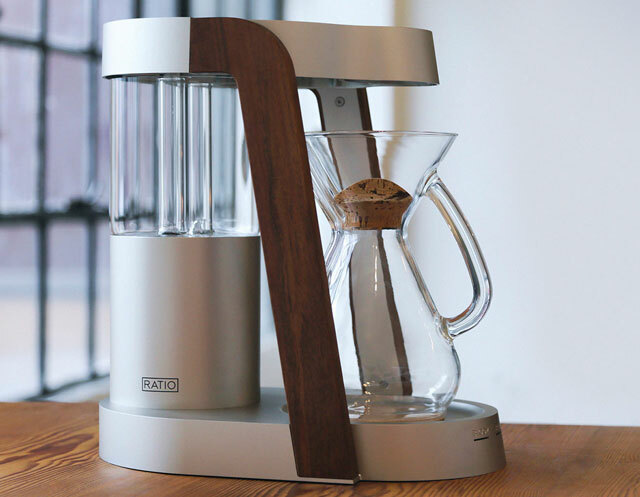 It uses a Chemex pot, and dispenses water at 202F. The hot plate keeps the coffee warm at 170F. But... the price is, shall we say, prohibitive. $570 at the current moment. And, due to living with a coffee-hater, (and not enough counter space), it doesn't really have a place in my current home. Someday, I'm going to have my own coffee shack (sorta like the, ahem, person-caves you see around) and then ... maybe.